I really don’t like beer, but I do like hard cider. So when I heard that cider was made in San Sebastian and you could have dinner at the cider house, I knew it would be something I would really like. Basque cider in San Sebastian is a little different to what we are used to because it is not sweet. 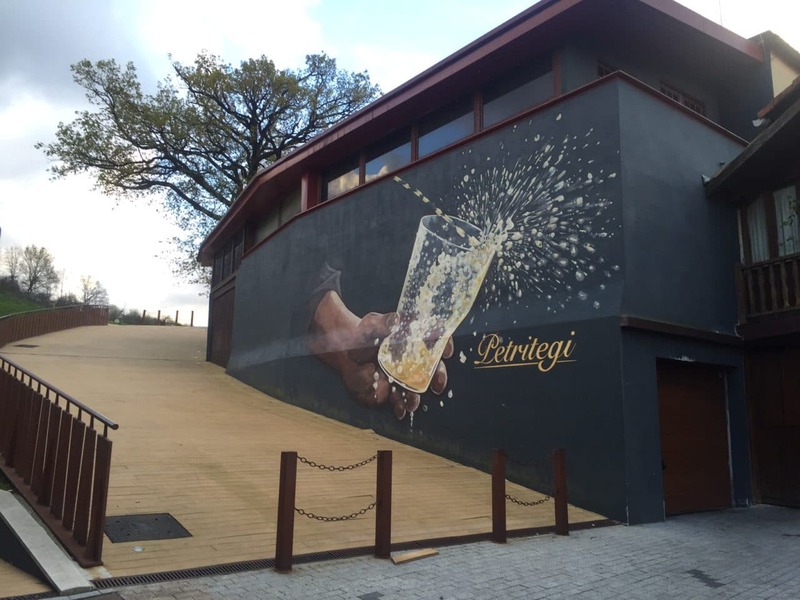 I was intrigued so I decided to take a tour with Discover San Sebastian to go to the Petritegi cider house, also known as Sidreria Petritegi. 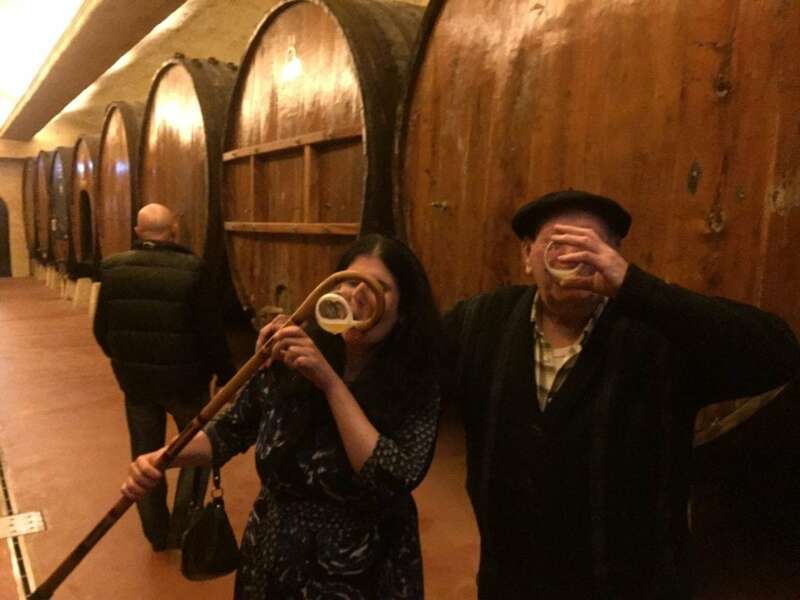 Let me tell you more about our experience at the Basque Cider House and tell you why you need to add it to your itinerary when you visit San Sebastian. Anisa and Russell outside the Petritegi Cider House. Eskerne, from Discover San Sebastian, picked us up at our hotel and drove us to the cider house. 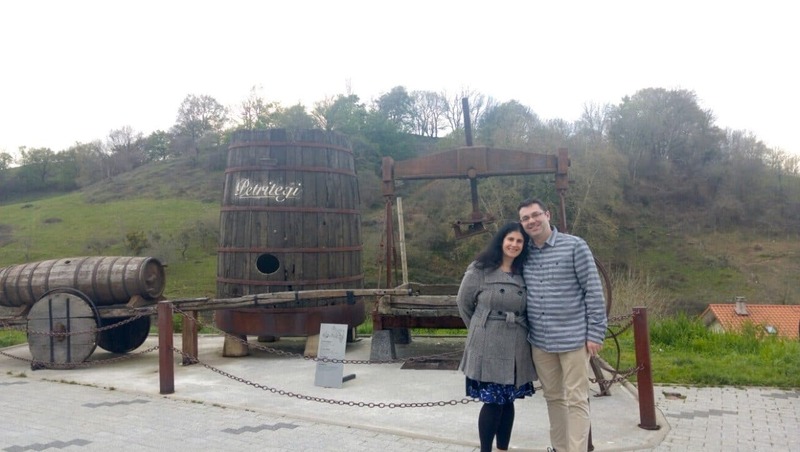 When we arrived, Zarika (from the Petritegi Cider House) gave us a tour and explained the traditional cider making process. Eskerne did a great job translating for us. They have been making cider here since the 16th century. The machines they use may have changed but the overall process has pretty much remained the same. I was really surprised to learn that the only ingredient in the cider is apples. The cider here is not sweetened like it is in other places. Basque cider is usually between 4-6% alcohol, so more alcoholic than American beer, but less alcoholic than wine. 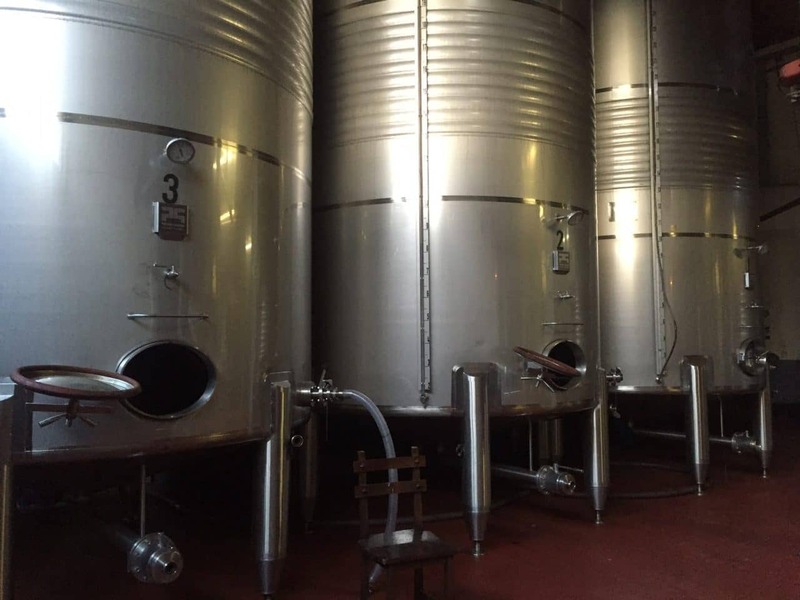 After our San Sebastian cider tour, we got to visit the cellar. This cider house has three cellars which allows them to stay open all year. Each cellar is kept at a different temperature. The colder cellars would keep the cider longer. Then we got our lesson on how to get the cider from the barrel. They are very particular about the technique. Axen (from the Petritegi Cider House) was in charge of picking the barrel and opening and closing the tap. First, you need to make sure that you tilt your glass slightly so that the flow of cider hits the side of the glass. Then you move the glass up to collect a small amount of cider. You are only supposed to take as much as you can drink in one sip. If you have more in your glass than you can drink in one gulp, you are supposed to pour it out because supposedly it doesn’t taste as good. I felt bad wasting cider so I would drink whatever was in my glass. And to me the second (and third) sips tasted just as good. An illustration of the proper way to get cider. So after our lesson, we went to our table in the restaurant section of the cider house, because it was time for some food. It felt like an indoor beer garden since most of the seating is benches. I didn’t know what to expect for the food here because I figured the real reason people come to the cider houses is for the cider. However, the food was really really good and you got plenty. Everything is served family style with long baguettes. Our first course was chorizo which was pretty tasty. In between each course, we would go back to the cellar to enjoy more of the San Sebastian cider. Our next course was an omelette, which was also delicious. Then more cider of course. One of the three different sections for dining inside the cider house. 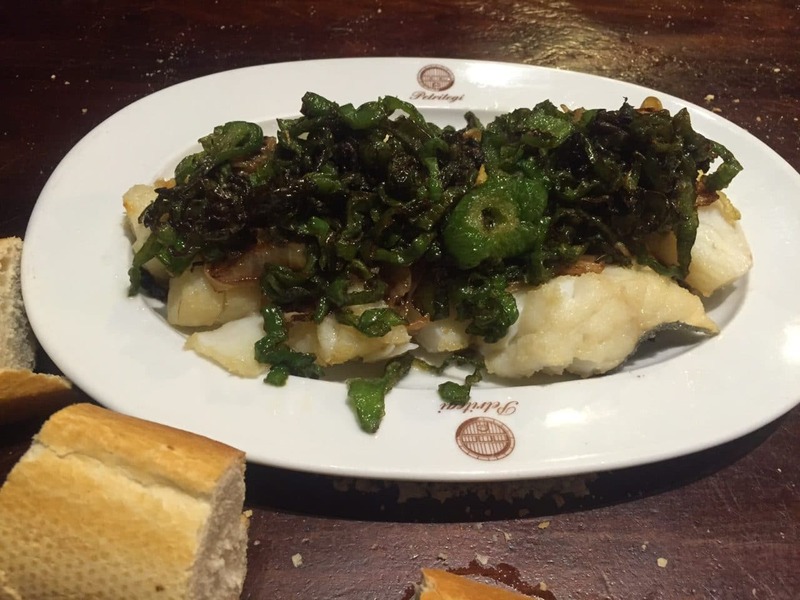 The next course was cod and peppers, which is a very traditional dish in the area. Then we had steak, which was served cut up sort of like Peter Lugers in NY. The steak was cooked medium and had great flavor, no need for sauce. Finally, we ended the meal with cheese and quince. It really was a lot of food. The cod with peppers was delicious! Then after you finish eating you go back for more cider. It is all you can drink cider, so people do make the most of it. As you can imagine, after all the cider between the courses, everyone was getting quite happy and friendly. Unfortunately, no one else really spoke English, but luckily we had Eskerne to translate. 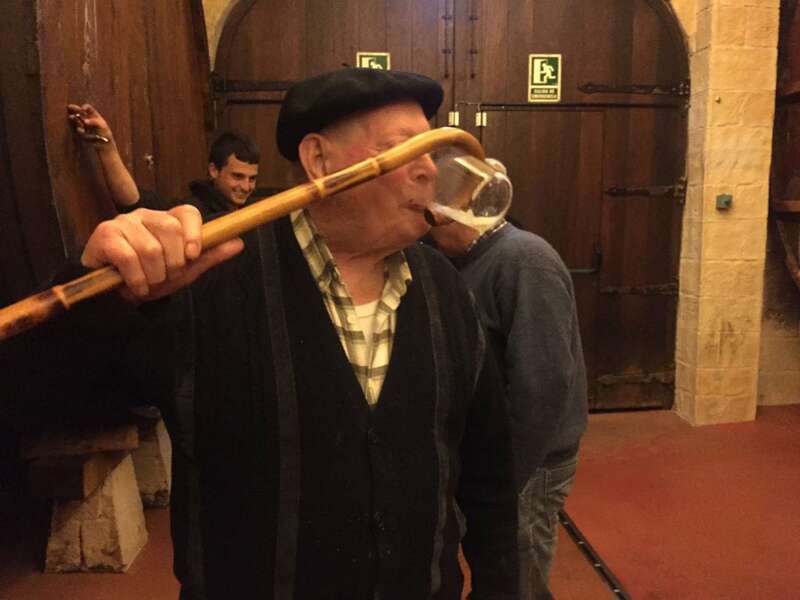 An older gentleman, Ilario, came into the cellar with his cane. We watched as he held his glass with his cane to get the cider and then drink it. We couldn’t stop laughing, what a character. Then he turned to me. He wanted me to use his cane for the cider! So I did! You may think this is an adults only place, but kids do actually go too. It is a very casual and laid-back atmosphere. Some families visit the cider house together. The night we were there we saw an adorable toddler. They even have a children’s menu. The kids can drink apple juice, while you have cider. Discover San Sebastian is a specialized tour company that Eskerne Falcon founded about a year ago. 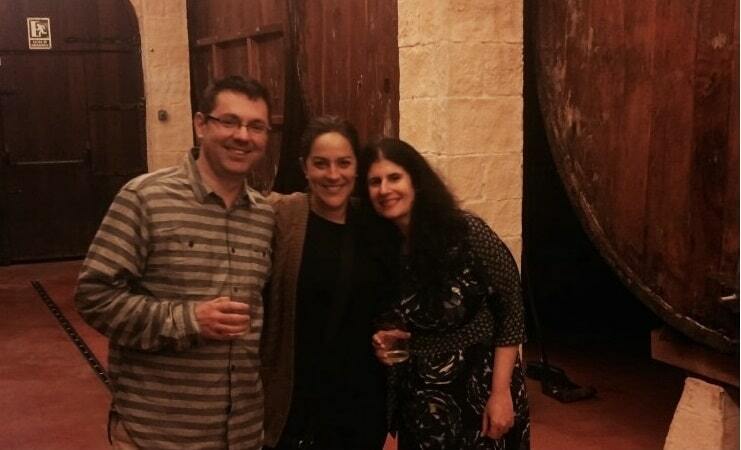 She grew up in the area and is very passionate about Basque Country – especially the food. She was part of the team that helped San Sebastian win the European Capital of Culture for 2016. Her English is excellent because she went to college in the US (at SUNY Binghamton). It was fascinating to hear her story about going to the US and not knowing a word of English and leaving 5 years later with a degree from a great university. Eskerne is very knowledgeable about the area and has experience working in restaurants and hotels in San Sebastian as well. She offers several different tours that are mostly food or wine related. She especially loves taking clients on her pintxos tours. We had so much fun with Eskerne! We had so much fun at the Petritegi cider house with Eskerne! I mean how can you go wrong with delicious food, some great Basque cider, and a fun crowd? So when you go to San Sebastian, save one night for a cider house. If you have been to a cider house, I would love to hear about your experience. The Basque cider is different from what most people are used to. It is tart! Bring the kids! Surprisingly it is a family-friendly environment. Learn the proper technique for drinking the cider. The cider should hit the side of your glass and you should only take what you can drink in one gulp. No financial compensation was received, but Discover San Sebastian did offer a discount on the tour. As always, opinions are my own. This sounds so fun! Definitely on my list of places to visit now. Susan – Great to hear! You will love Basque Country, more posts to come. So much to do and yes we really had a lot of fun at the cider house. You should try the cider in England, too, especially scrumpy. When I moved to the US I was really upset to find that the “cider” was non-alcoholic! Yes, since I don’t like beer when I’m in England I usually drink cider at the pubs. It is tasty! We do have some alcoholic cider in the US but yes it is more a non-alcoholic drink here. Yes, I’m planning on giving Anisa some proper English cider next time she’s over. I think she’ll like it. Looks like a great adventure. I too love cider and will occasionally order a hard cider in a bar. They are always less alcoholic than beer. Thanks Elaine. Yes! For me, I prefer the taste of cider over beer. This looks like so much fun. I’ve been to wineries, breweries and distilleries but never where they make hard cider. I love the way you go back to the cellar between each meal course. Connie – It was so much fun! This was my first cider house experience. I’m not sure it would be the same in other countries – I will have to do some “research” and find out. I like cider and beer so I guess I’m always happy! The cider in the Basque region is different than other ciders though. Still delicious, but different. What an awesome tour you had! Yes the cider was tart. Not sure which cider I prefer. They are all good. What good memories of Madrid and my first Spanish cider your post brings back, although I’ve never tried it with a cane! I like the taste . . . appreciate that it’s neither so sugary that it breaks me out nor so strong that it KNOCKS me out! Melodie – Glad you enjoyed the blog. 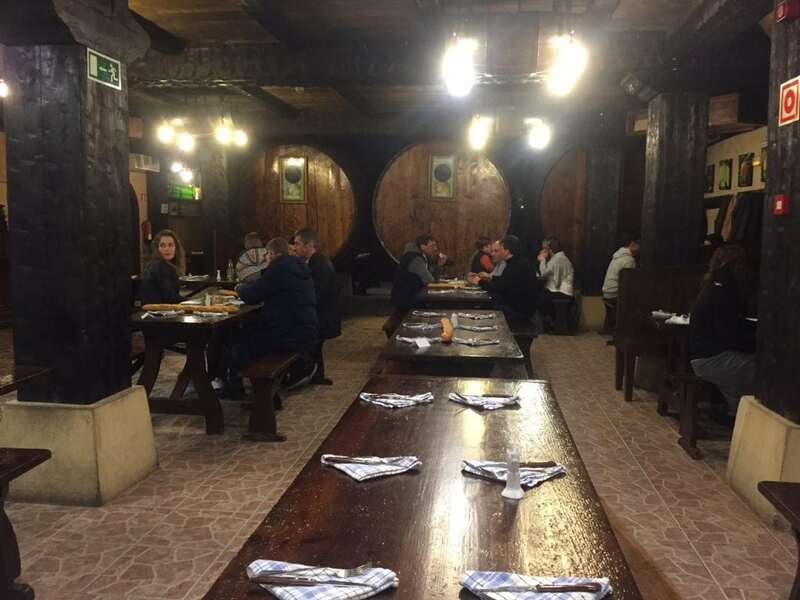 So do they have cider houses in Madrid that are like this one? Yes, but perhaps not quite as large. Casa Mingo was the place but I don’t recall seeing barrels as large as these in the dining area. Will definitely check that out next time I am in Madrid. Thanks for the tip. I love cider but never tried cider with a cane. I’ll have to check that out next time I’m in Madrid. Yes! The cane was quite unexpected. Enjoy Madrid!